Para Sa Kinabukasan. It was my first time to join and it's for a good cause. 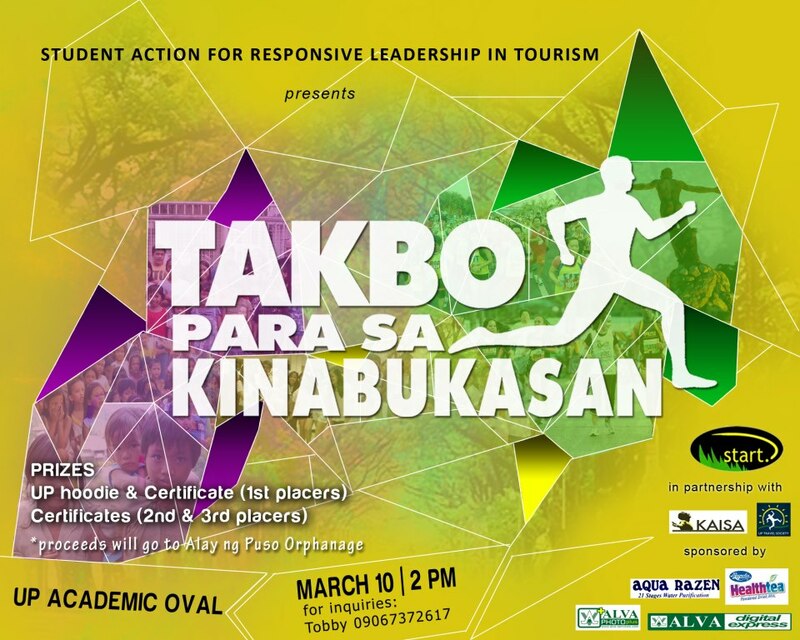 The advocacy run was organized by Student Action for Responsive Leadership in Tourism (START-AIT) together with University of the Philippines Travel Society and Nagkakaisang Iskolar para sa Pamantasan at Sambayanan (KAISA). It calls for a critical and responsible voting this election and it's also a benefit run for Alay ng Puso Orphanage. It was a fulfilling activity for my pre-birthday. I don't usually run so I signed up for the 3K, because I know that I tire too easily. And it's my first time so I'm building up my resistance. Next time, I will run for 5K and then 10K and then I will join a triathlon! When I told Luke this, he rolled his eyes. I know I'm kidding myself, too. Ha ha! Luke ran for 5K, and he treated me to an ice cream pre-run. So, I finished 20th out of 70 plus contestants. Hey, not bad! I ran for 20 minutes 13 seconds, if I remember correctly. I didn't get anything, obviously. Hehe. Glow in the dark bracelets! I became a miser for them. So I went back to my room and when Gabi opened the door she was holding this for me. Awww, so touching. I have the most awesome roommate in the planet! ❥ The closest people in my life know how much I love Red Velvet. Looking forward to joining more fun runs! And it's my b-day in less than five hours. Yay!